This converts the steering wheel rotation into lateral movement that then moves the road wheels to steer the vehicle. This system requires fewer linkage parts resulting in substantial weight savings and is very popular with most manufactures today. 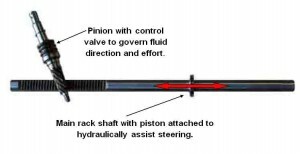 The main rack shaft in a power steering rack has a piston attached to the shaft and the pinion has a control valve built around it. When the pinion valve is turned it controls the fluid that is supplied by the power steering pump and directs the fluid to piston attached to the main rack shaft then the fluid forces against the piston to give the steering assist (i.e. power assisted steering). 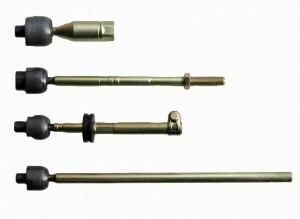 Power Steering racks are designed extremely well by each vehicle manufacturer, they are very compact and they need to be so they can fit into our modern-day motor vehicles, but with all this design criteria the under bonnet temperatures are getting higher and higher this can cause some problems. The most common problem with most power steering is leaking fluid out of the unit. The next common problem is the wear and tear on the unit like free-play due to excessive use of the steering unit or lack of maintenance on the vehicle. To fix these issues the steering system need to be checked on regular intervals, Ultimate Power Steering recommend's that the system is inspected by your mechanic at each service. We also recommend that the Power Steering Fluid be replaced at least every 40,000Kms or 2 Years this will insure that the system functions correctly for as long as possible this will save you money. If the steering rack is found to be leaking or it has excessive wear and tear it will need to be replaced or it can be remanufactured. 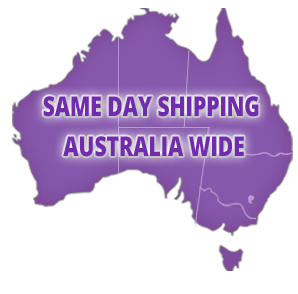 We recommend the remanufacturing option as it is the most cost effective result and it is also a lot kinder to our environment. The remanufacturing process is less polluting than a new unit, because we recycle approximately 65 to 80% of the original steering unit. At Ultimate Power Steering you can have confidence in us as you're guaranteed Quality and Service with all our products.